Another month, another SprezzaBox, as we continue to investigate which of the monthly subscription boxes for men reigns supreme. 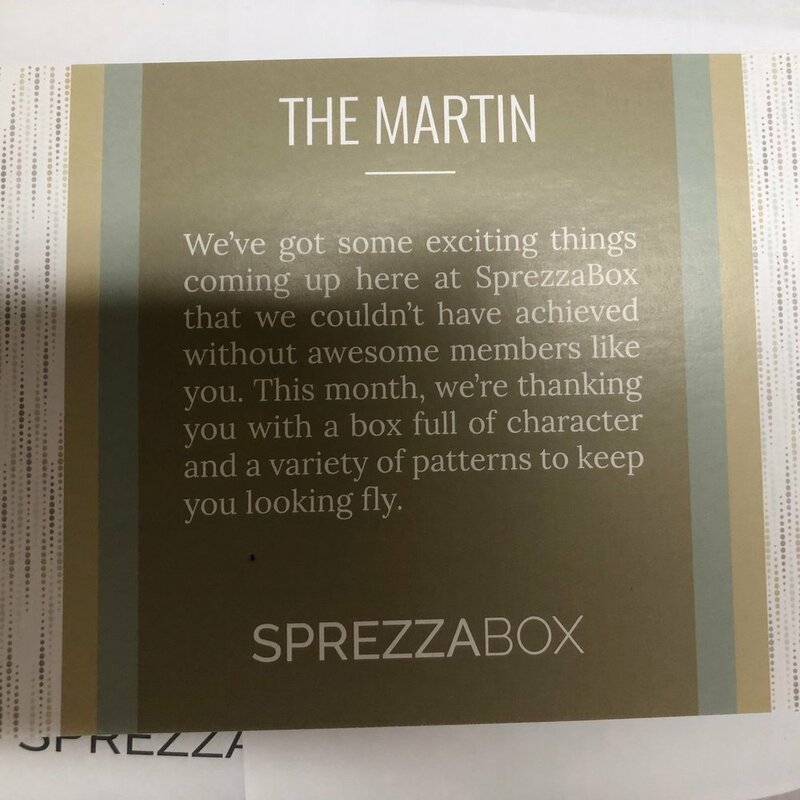 Last month’s SprezzaBox was pretty fantastic, and we said that we would just have to see if they were able to keep the great boxes coming. So, how did SprezzaBox do this time around? Did they prove their consistency as being, perhaps, the best of the monthly subscription boxes for guys at this price point? Read on and find out! The Knottery Striped Tie — $55: A really nice pattern and texture here. It’s 2.75” wide (just shy of my desired 3.00”, but not stupid-skinny either). Pretty versatile, and can be worn with a navy or grey suit and look killer. I think this may actually be one of my favorite ties received in a monthly subscription box to date. Is it truly a $55 tie? Probably not. But it is nice. Sprezza Herringbone Pocket Square — $18: This is for sure my favorite pocket square in a monthly subscription box. I love the herringbone-ish pattern, as well as the awesome fall colors. Goes great with the tie (though I fear it might be too “matchy-matchy”), and would love killer with a navy suit. Sockrates Brown Argyle Socks — $12: What is with companies and charging ridiculous prices for socks these days? This pair of socks is simply not worth $12. Is it a nice pair of socks? Sure. Are they as good quality as any other decent pair of socks? Undoubtedly. Does the brand have an awesomely clever name? Of course. But $12? I don’t know about that. Again, these socks go great with the tie and pocket square provided (though, again, I would likely not wear all three at once for fear of being too, you guessed it, “matchy matchy”), and would look very sharp with a navy suit. Lovely Lapels Moustache Lapel Pin — $12: Likely in honor of “No Shave November,” a lapel pin in the shape of a mustache. Seems solid-enough quality, but I don’t wear lapel pins. If you do, this would likely be a fun addition. If you, like me, are not a lapel pin kind of guy, this is going to the thing you give away to friend from this month’s box. Dog Tag Bottle Opener — $10: It is items like this which make me really like SprezzaBox. Is a dog tag bottle opener necessary? Not at all. It is not the sort of thing I ever would buy, nor even think to buy. Which is, of course, exactly the point. You can also always take off the dog tag and simply have a super-portable bottle opener to stick in your wallet, perhaps. Again, I don’t think this is something I will use all too often, but the point I am making is that I really like that SprezzaBox will send you things that are not just the classic tie/pocket square/socks/hand cream sort of thing. I like those sorts of items as the staples in the box, but I enjoy seeing something surprising and delightful and out of the ordinary also, and SprezzaBox does a great job with that. 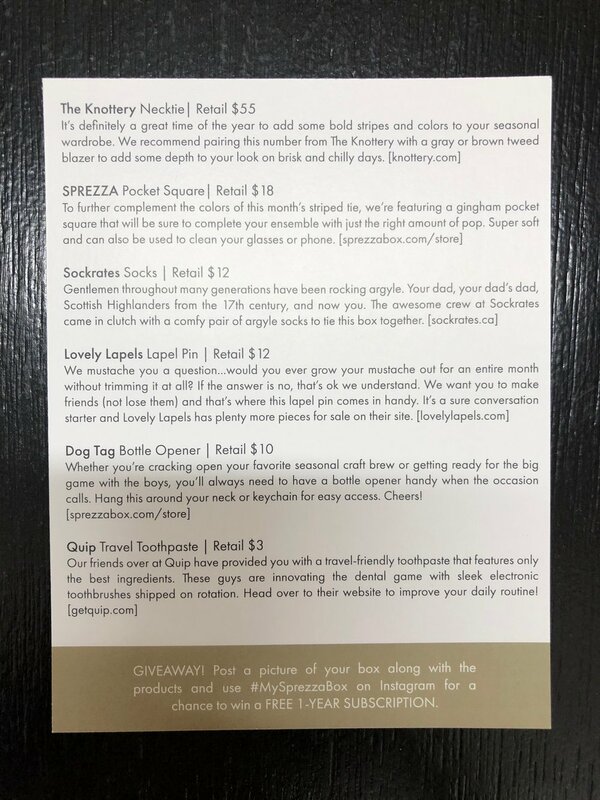 Again, with everything in mind that we have discussed in all the previous reviews of these monthly subscription boxes, I really think SprezzaBox continues to bring a great value every month. Are the boxes truly worth exactly what they claim? Likely not. Still, they always exceed the $28 you pay for them, and getting SprezzaBox in the mail, and opening it up, is always something I look forward to each month to see what interesting and cool new products they decided to send this time around. I think this box is another very solid addition to their hit streak, and they continue to hold first place in my mind for a monthly subscription box at this price point. Gentleman’s Box for this month is due to arrive in just a few days, though, and we will see how it stacks up this month before we declare a definitive winner between the two. Be sure to check back then! Oct 11 SprezzaBox In Review 1.0: How Does It Compare To Gentleman's Box?